1. The last time we talked was in November 2007 a little while after your first book “Goth Craft” was released. What have you learned between then and now? I’ve learned many things, particularly spiritually! It’s hard to quantify; I don’t entirely remember who I was then; I only know who I am in the present… I’m sure I’ll say the same thing in another year! But, I can safely say that I’ve learned what it’s like to put myself ‘out there’ on a larger scale. And I wouldn’t take it back for anything in the world. I’m so happy I’m “spreading my wings,” if I may use the pun. 2. Your new book “Shadow Magick Compendium” looks like it covers a lot of different stuff: toxic herbs, fasting, dispelling harmful behavior patterns, the Witch hunts, mysticism and more. What do all the different things you discuss in your new book have in common, if anything? For me, I see certain things as having a strong connection to shadow or darkness as a spiritual force of nature; I compiled the book with this in mind, and have tried to stay close to that examination throughout. When I was doing my edits for the book, I realized how deep some of the material actually is. I hadn’t really considered its spiritual scope until I took a “bird’s eye view” and examined it from a reader’s perspective (editorially). I hope beyond measure that the material will help positively and progressively influence other peoples’ evolving spiritual paths. There is far too much suffering in the world; it’s all we can do—and should do—to help both ourselves and one another as brothers and sisters in this experience of reality. 3. Also, what made you decide to not write more about the Goth culture in your new book? I’m over it. Hah! Yep, it’s true: I put my piece out there about dark subculture, and now it’s time to move on to strictly spiritual focuses. 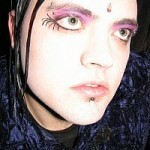 I don’t want to be known as “that Goth guy,” because there’s much more to my writing and spiritual path than that. Though dark culture is significant and beautiful, there’s no need for me to keep trippin’ on it. I’m concerned with consciousness, Awareness, and compassion, and the mediums for musing those frequencies is always changing. You will also find that my focus in writing will not always stay “dark,” though metaphysical darkness is my own familiar spiritual root, so I’ll still always pull from that area to some degree naturally. 4. Another Llewellyn author who encourages a darker look at magic is Konstantinos (author of ‘Nocturnal Witchcraft’). Are you familiar with his work, and if so, do you feel you share in the philosophy of working with darker energies is not evil? Well… I’m familiar with his work, but personally draw no parallels between his writing and mine, save for the fact that darkness (as an energetic force) is examined. I much prefer dark occult authors like Michelle Belanger, Robin Artisson, John J. Coughlin, Michael Alexandra Davida, Corvis Nocturnum, Nathaniel J. Harris, and Leilah Wendell. 5. I know you love music, so I have to ask, what are you listening to right now? Oh shoot… right now? Lemme think. Well, today I listened to CDs by The Mission, Sopor Aeternus, and Fiona Horne. Sitting on this pile next to me is Monica Richards, Stevie Nicks, God Module, and the Gypsy Nomads. In my car I’ve been playing Nick Warren, Aphex Twin, Collide, Tori Amos, The Congos, and of course my beloved Smashing Pumpkins. 6. I totally can’t wait for the soundtrack for “Repo! The Genetic Opera” to release. Have you heard any music from it yet? I think you would dig it. No clue! Never heard of the film or soundtrack. I’ll keep an eye out for it, though! 7. I can’t believe I didn’t ask you this last time, but how did you come about taking the name Raven Digitalis? Well, the Raven has always been one of my spirit animals (I also discuss spirit animals heavily in Shadow Magick Compendium). I’ve known the Raven as my primary astral guide since I first got into the Craft back when I was 16. He’s stayed with me since, and I’d imagine he always will. I’ve recently also discovered that Cricket is a new, additional spirit animal I’ve been Given. As for Digitalis, well, it’s the Latin name for the foxglove plant. Just as people have spirit animals, we also have spiritual plant allies—foxglove happens to be mine. So, the names sounded nice together—and, this was before I discovered that Digitalis is also the name of a heart medication; an extract from the foxglove plant—and I went with it. But, my birth name is Colin (shhh). 8. Any chance you could help me come up with some cool sounding alias? I’m so lame even my City of Heroes character is just named Amazing Rebecca. Hmmm. Well, my alias is a portion of my magickal/spiritual name, so that’s one option. It’s not an easy process to find one’s spiritual name (if one was to use their spiritual name as their alias), but we are all vibrationally aligned to different forces, and can use those alignments to form our magickal names (I discuss spiritual/magickal names in Goth Craft). And thanks—I also think ‘Raven Digitalis’ sounds cool, and I’m lucky to have it as part of my spiritual name! For you? How about Mozilla Firefox? –oh wait, that’s already taken. Damn! 9. I asked last time, and I gotta ask again, what’s next? Oh, the future is rarely predictable. As far as writing, I have a number of things in mind… a fun little spellbook, some fiction, and some other projects. I also tour in various parts the country fairly regularly—mostly the Northwest, as well as Denver and San Jose (for PantheaCon!). One can always stay tuned to my website or MySpace to hear about my updates! Okay! Hmmm… do you think that Gerald Gardner should have created more involved codes of ethics with the founding of Wicca? And, do you think that his fabrications about the history of Witchcraft and its origins served the Neopagan revivalism well, or just put a bad taste in peoples’ mouths in terms of legitimizing earth-based spirituality? Raven, you make me crazy, which by the way makes my husband officially your biggest fan. Let me see what I can say to all of that, and remember folks, I’m not an expert…I’m not even Wiccan! From what I understand Gardner took a hodge podge of old traditions and managed to pull them together and present them to a more modern audience in a way that obviously resonated with them. Although many modern Wiccan practices can be traced back way past Gardner’s existence, without him I don’t know how many people would know about them today. If I could do that, I wouldn’t hide that knowledge, I would share it. I’d be like, booyah, I took a bunch of ancient practices and created this pretty cool thing that people like. Yet he felt people wouldn’t be that impressed and since many Wiccans deny the idea that maybe, just maybe, Gardner did a little fabricating, he was probably right. Personally, I think his hype served the revivalism well in the beginning but now seems to leave more of a bad taste in people’s mouths. I’m not entirely certain what Gardner’s founding ethics were, but I’ll share a little bit on my thoughts about Wiccan ethics. I’m a total fence sitter. Yeah, I’ll admit it. I like the rule of three and harm none and all of that. I think it’s responsible and a good way to live your life, not just practice magic. That said, I know people who don’t concern themselves with those ethics, and I still find them to be wonderful, moral people. I think the flexibility in perceived ethics is one of the things that makes Wicca such a diverse faith. So many philosophies falling under the same banner. Of course that same diversity makes the faith full of schisms. Perhaps if Gardner had laid down the law more Wicca would be a more potent unified faith, but I think a lot fewer people would be involved it. That’s it Raven, gloves off for the next interview…I’m making you jump through all kinds of hoops! 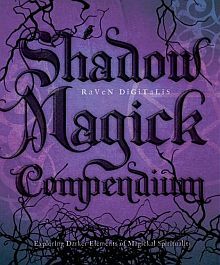 Raven Digitalis (Missoula, MT) is the author of Shadow Magick Compendium: Exploring Darker Aspects of Magickal Spirituality and Goth Craft: The Magickal Side of Dark Culture, both on Llewellyn. 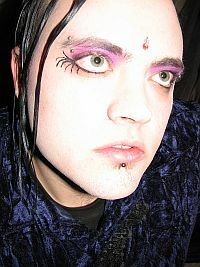 He is a Neopagan Priest and cofounder of the “disciplined eclectic” shadow magick tradition and training coven Opus Aima Obscuræ, and is a radio and club DJ of Gothic, EBM, and industrial music. Raven holds a degree in anthropology from the University of Montana and is also an animal rights activist and black-and-white photographic artist. He has appeared on the cover of newWitch magazine, is a regular contributor to The Ninth Gate magazine, and has been featured on MTV News and the ‘X’ Zone Radio program. Previous postGuess What Today Is! Next postAre You Reading This?